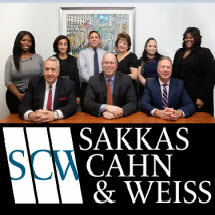 In New York City, if you have suffered a serious injury, turn to the experienced personal injury lawyers of Sakkas, Cahn & Weiss, LLP. Our attorneys have secured nearly $500 million for our clients. We have more than 60 years of combined experience that we rely on to help us build the cases our clients need. We know the devastating effect that serious accidents and the injuries they cause can have on people's lives. The challenges of working to recover from your injuries can be enough to overwhelm anyone. Add to that the financial difficulties that can be created by mounting medical bills, and even the most financially stable household can experience anxiety and stress that can interfere with one's ability to focus on recovery. The successful pursuit of compensation for your injuries can be a complicated process. There are many opportunities for mistakes to be made without skilled guidance showing you the way. For example, insurance companies will want to speak with you. While they may claim to be simply information gathering, the reality is that they are often looking for any information that will allow them to minimize or deny your claim. Speaking to insurance companies without the benefit of counsel can weaken your ability to recover the compensation you need. We are committed to providing our clients with the exceptional representation they need. To schedule a free initial consultation with one of the New York personal injury attorneys of Sakkas, Cahn & Weiss, LLP, call 212-571-7171.